Prepatellar bursitis is also called housemaid's knee or carpenter's knee. A bursa is a fluid-filled sac which ensures there is less friction between body parts. 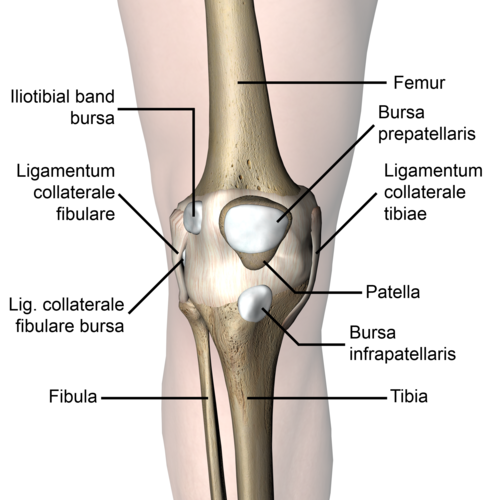 The prepatellar bursa is located superficially between the skin and the patella. The inflammation of a bursa is called bursitis. This inflammation can take form by either an infectious nature (30%) or a non-infectious nature (70%). A direct fall on the patella, an acute trauma, repeated blows or friction on the knee may cause prepatellar bursitis. Other causes include infections or low-grade inflammatory conditions, such as gout, syphilis, tuberculosis or rheumatoid arthritis. Prepatellar bursitis often occurs in specific jobs which involves a position where they work on their knees for a prolonged period of time such as miners, gardeners, carpet layers and mechanics. Constant friction between the skin and the patella  can be a cause of this condition. By the impact, the damaged blood vessels in the knee result in inflammation and swelling of the bursa. Actually, a bacterial seeding of the bursal sac caused by a hematoma is rare, because of the limited vascular supply of the bursal tissue. Infection:Typically for a septic prepatellar bursitis is a break in the skin near the bursa, which leads to swelling and pain around this area. This happens when a bacteria (for example S. Aureus, 80% of the cases) have passed across the soft tissues from a break in the skin and begins to multiply within the bursa. When a bursa is infected it can probably cause pain, fever, tenderness and an elevated amount of white blood cells. Co-existing inflammatory disease- rheumatoid arthritis, gout etc. If bursitis is caused by an infection, pain is associated with fever and chills. The treatment for prepatellar bursitis depends primarily on the cause of the bursitis and secondarily on the pathological changes in the bursa. The primary goal of treatment is to control the inflammation. Conservatively, the R.I.C.E regime  in the first 72 hours after the injury or when the first signs of inflammation appear. Medications including non-steroidal anti-inflammatory drugs, topical medications- creams, sprays, gels and patches can provide pain relieve when those are directly applied to the skin over the knee. To reduce the gastrointestinal side effects that can be caused by oral medications, topical medications may be a good choice. Also, for cases of septic prepatellar bursitis, antibiotics is used to treat the infection. When conservative treatments have failed as treatment for chronic/post-traumatic prepatellar bursitis, outpatient arthroscopic bursectomy under local anaesthesia is an effective procedure. Arthroscopic or endoscopic excision of the bursa has more recently been reported to have satisfactory results with less trauma than open excision. Once the initial inflammation has reduced a program of stretching and light strengthening will be initiated to restore full motion and improve strength to reduce stress on the tendons and knee joint. Therapeutic exercises to strengthen and stretch the muscles of the knee. This includes static contraction of the quadriceps. This should be an exercise that the patient can do at home 1 to 3 times a day. The objective of the rehabilitation is that patient can resume their everyday activities.To see if the exercise is working you have to put your fingers on the inner side of the quadriceps, you will feel the muscle tighten during the contraction of the muscle. The patient has to hold his contraction during 5 seconds; the exercise can be repeated 10 times as hard as possible. It is important not to forget this exercise must be pain free. Also the stretching of the quadriceps is a good exercise for the patient, it reduces the friction between the skin and the patella tendon. There is less friction when the patella tendon is more flexible. The physiotherapist can also help the patient by using electrotherapy modalities and patient education on the use of knee pads for kneeling activities. ↑ 2.0 2.1 2.2 Mcafee J.H. et al.. Olecranon and prepatellar bursitis: diagnosis and treatment. West Journal Medecine, 1988; 149: 607-610. ↑ Baumbach, S.F., et al. Prepatellar and olecranon bursitis: literature review and development of a treatment algorithm. Archives of Orthopaedic and Trauma Surgery 2014; 134: 359. ↑ Rennie, WJ, Saifuddin, A. Pes anserine bursitis: incidence in symptomatic knees and clinical presentation. Skeletal Radiol 2005; 34:395. ↑ Peer M.A. et al., The Knee Injury and osteoarthritis Outcome Score (KOOS): A Review of its Psychometric Properties in People Undergoing Total Knee Arthroplasty. Journal of Orthopaedic and Sports Physicial Therapy 2013; (4057), 43 . ↑ Panken AM. et al. Clinical Prognostic factors for patients with anterior knee pain in physical therapy: systematic review. int J sports Phys ther 2015; 929-945. ↑ Crenshaw AH. Campbells’s operative orthopaedics. St Louis: Mosby; 1992. ↑ Huang YC, Yeh WL. Endoscopic treatment of prepatellar bursitis. Int Orthop. 2011 Mar. 35(3):355-8. ↑ Gendernalik JD, Sechriest VF 2nd. Prepatellar septic bursitis: a case report of skin necrosis associated with open bursectomy. Mil Med. 2009 Jun. 174(6):666-9.